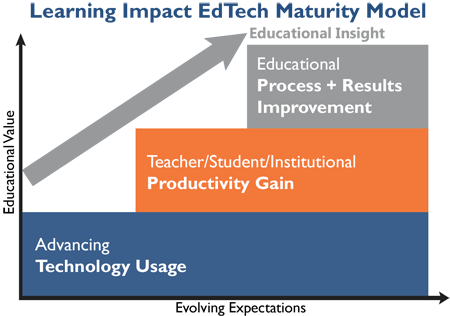 Educational technology adoption is on a 3-tier maturity curve. The first level is the adoption of up-to-date and relevant technology to support the curriculum. The second level is technology that helps teachers and students do what they already are doing, but more efficiently. The 3rd level is adopting technology that actually helps to improve educational results and processes. All levels can be considered "innovative." However, more and more the expectations from institutional leaders, parents and students is that EdTech needs to provide educational value at all levels, with higher expectations at level three. Here, EdTech needs to support and enable better processes, measureable results, and provide substantial educational insight into student engagement, performance and outcomes for individuals and across the curriculum. To achieve this high level of educational insight across EdTech products, integration is a requirement, not just something that is nice to have. When there is a common architecture and extensive ecosystem available that enables the required integration your organization should take advantage of it. That's what IMS provides. IMS Global goes further by looking ahead and making sure the right connectors, protocols and data vocabularies will be ready as EdTech moves into the future. The support and work of the IMS Members makes that possible. Join the cause!